After 10 consecutive days of strong winds blowing into the 20s and 30s including enough to force the cancellation of the Whitebread Race the previous week, the winds abated and the skies brightened for the Greenport Ocean Race and the Greenport Bay Race on Saturday, October 10. All of the boats that came to Greenport, NY sailed in those heavy winds for their deliveries and on the Friday evening before the race we still had winds to 30 knots and rain. We had been watching the forecast carefully, because when the wind did start to slow down it was supposed to drop out dramatically. The course decision for both the Bay Race and the Ocean Race had to be made by 7am, and the decision was not an easy one. It was still blowing from 12 to 18 at that time, but the prediction was that by early afternoon it would drop to less than 5. The decision was made to use the short course for both races. In the case of the Ocean Race, that meant instead of going around Block Island the fleet would sail from Greenport out past Gardiners Island, leave Cerberus Shoal to starboard and then go to “G1,” a few miles off of Montauk, and finish back in Greenport. This turned a 90-mile course into about a 65-mile course. For the Bay Race going west, the short course eliminated going around Robins Island and changed the length of that course from about 35 miles to about 28. “Ever since I bought my J/105 Reckless in the spring of 2012, I had heard about the Greenport Ocean Race as other J/105 sailors talked about the fun of big winds on long distance reaches (plus the late night pub crawl afterwards!). This year we made a late decision to cross over from Connecticut and join the fun. As it turned out, the big winds were on the Friday delivery, where I had 25 to 35 knots right on the nose, along with big and steep seas. I have to say I was tired Friday night even before the racing started! 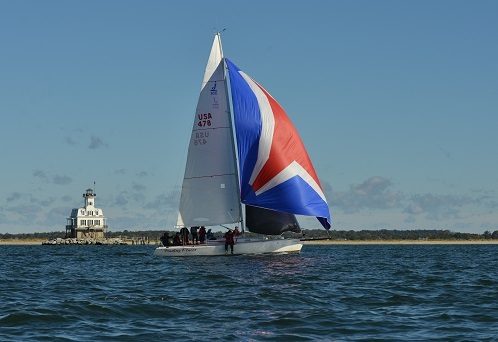 As the cold front passed through Friday night, we ended up on Saturday with dying and fickle breezes, sailing the shortest course out to Montauk and back. So instead of being challenged by big winds and seas, we were mentally and emotionally challenged. Heading out of Greenport, the big boats including Siren, an RP 56, Barleycorn, a Swan 42, and Longbow, a Class40, rapidly charged away from us while we narrowly led Alliance (the 105 that won the overall last year) and Misty, a J/40, who tangled with each other. In a short time the winds got squirrely and they opted to go north while we kept more east headed to 1GI. They picked up a nice wind line and sailed right around us. It looked like we were cooked even before we rounded 1GI! We kept sailing hard and then had the rear­view advantage of seeing the wind go light for them as they headed to Cerberus, so we decided to head northeast from 1GI, taking a longer course, and sailed right around those two and Weegie, a Columbia Carbon 32! Our emotions soared back up to excited and hopeful. What we didn’t know was that the tide was about to turn again. We rounded Cerberus well ahead, but then we completely ran out of wind and sat for at least 30 minutes as we watched Alliance round Cerberus and pass us. Again, our emotions tanked, not only because they were now ahead and we lost all that we gained back, but we also owed them time so we were not sure how we’d make time back, especially in these conditions. We decided that if and when the winds came back, it would be from the south, we headed a bit away from the mark again and sailed (or crept) southwest toward the South Fork seeking wind. We found more pressure ahead of Alliance and while we were headed now towards Bermuda, low of Montauk, we kept our spinnaker up trying to maximize speed through the water while Alliance went back to their jib, straightlining for Montauk. They gained, we held, they were lifted, we surged with a little more pressure. Sailing anxiously to the mark, we were able to open up five minutes by the rounding. So now what? What was the wind going to do? Since it had worked so well before, we went back to the spinnaker trying to maximize speed in the light conditions, while sailing low of 1GI hoping we’d secure a lift when the wind backed from southwest to south. We also figured we’d have a bigger push from the favorable current out in deeper water. Alliance decided to keep to their jib and go high along the shore hoping for pressure sooner and hoping we would never get our lift and have to tack to get there. It was an anxious game we played watching each other, and while the wind did not back, we made it west faster than Alliance and went back to our jib to gain height for the mark. Steve won Spinnaker Division 2 and the Brooklyn Ocean Challenge Cup and he was followed by last year’s winner of the BOCC, Steve Guyer’s 105 Alliance. In Division 1, local J/111 Bravo, sailed by Sedge and Andrew Ward, took first, followed by Rich Fleischman’s Columbia 32 Weegie. While the Ocean Race started at 9am, the Bay Race didn’t start until 10:30. We started in about 10 knots of breeze, rounded a weather mark and the fleet sailed downwind in a moderate 8- to 10-knot breeze. The Non Spin boats started 10 minutes ahead so it was fun having all 30 boats in the Bay Race together as the Spin boats caught them. After about an hour and half, that breeze dropped to five knots and an hour later it was far less than that. Eventually it faded to nothing and a new light southerly came in. That was just as shifty. At one point there was an Etchells a couple of hundred yards behind us, pointed in exactly the same direction and on the opposite tack. From the beginning Purple Haze, a Henderson 30 skippered by Lee Oldak, got out in front and just steadily pulled away. Eventually Waterwitch, a 48-foot custom boat skippered by Jay Cross, got her legs and did the same. The rest of us battled it out to keep our boats moving at all. Boogie Van, Jody LoCascio’s Express 27, who had been way back, closed the gap in the new breeze and was able to cover for second, with Waterwitch taking third. Kevin Horne’s Ranger 26 Cali won the Spinnaker 2 class, followed by Greg Ames’ Hunter 37 Seventh Heaven. In the Non Spinnaker Class, Fred Endemann’s Alerion 28 Windsong crushed the fleet, followed by Bill Rich’s Fishers Island 31 Spindrift. The Orient Cup for the best corrected time in the Bay Race was won by Purple Haze. A prudent decision to shorten both short courses was made by the race committee (my wife Mindy). The Bay Race was shortened to Buoy “6” just outside of Sag Harbor and the Ocean Race was shortened to 1GI (Gardiners Island). 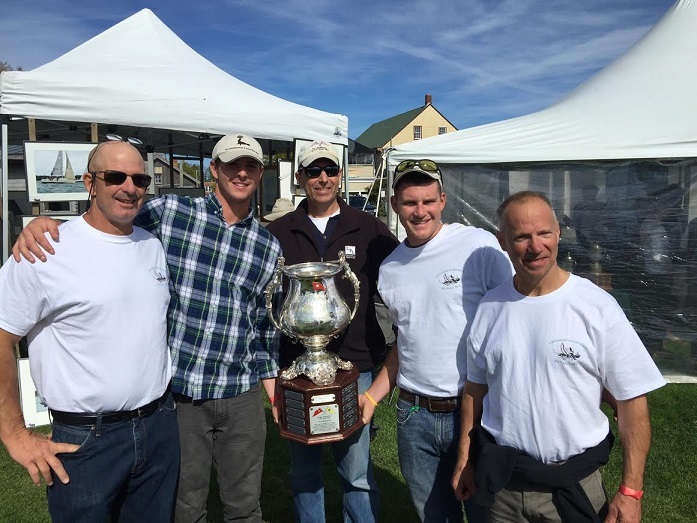 The Greenport Cup for the first boat to finish the Ocean Race was won by William Hubbard’s Reichel Pugh 56 Siren, and the Old Cove Yacht Club IRC trophy was won by Brendan Brownyard’s Swan 42 Barleycorn. All boats from both courses were in by dark, and crews were able to descend upon beautiful downtown Greenport for the pub crawl and dinner. For the pub crawl, each boat was given two cards on lanyards that entitled the wearer to a free beer in eight different establishments. It was great because you would see other lanyard wearers and ask what boat they were on. Conversations would get going and you’d have new friends. For me, it was nice to put some faces with the entries. I love all of the restaurants on the crawl, but somehow we always end up with a large crowd settling in at Little Creek Oysters. The weekend concluded with a really nice awards party on a beautiful, warm sunny Sunday, where we were once again blown away by Chef Vinny’s barbeque that included bratwurst sliders, sesame orange chicken skewers, filet mignon, horseradish cream, lamb chops and pork tenderloin, plus a raw bar, free craft beer and local wine. We gave out all of the racing awards and then had a drawing for a seven-day charter of a MarineMax 443 in the BVI. The winners were Michelle & Kevin Horne. They’ll be back next year, too. My question is, why has a J/105 won the overall trophy eight years in a row? Greenport Ocean Race Chairman Jim Ryan enthusiastically races his Melges 24 Wasn’t Me with the Peconic Bay Sailing Association.